After watching Real Estate experts from various building societies informing us “What the Average Price of a house is in the UK”. I am often tempted to write my own article about how much of that great advice should be filtered through a local real estate expert. There is no such thing as a “National Real Estate Market”. All real estate is local, and local news and statistics are what matter. To clarify: national real estate trends don’t have much to do with why a homeowner should or shouldn’t list their home for sale. And, likewise, they don’t have much to do with what local buyers should consider offering on a home. All Real Estate is Local. The process of buying and selling real estate, as well as pricing and marketing, are very local. It doesn’t matter to a home buyer or sellers in Manchester what the market is doing in London or Glasgow. Exactly the same scenario exists in Spain, somebody buying or selling a property in Almeria, isn’t interested in the market in Barcelona or Madrid. For Two Main Reasons: Laws are different in different provinces, and practices are different, because of laws and regulations. • Employment can be booming in some communities, while not in others. • Supply and Demand still determine the local market. 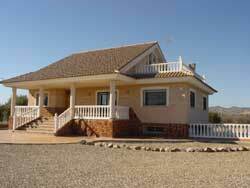 • Even within the Costa Almeria, Costa Calida, there are neighbourhoods which are in high demand. They always seem to have more sales, less time on market and higher home prices. • Local Banks are increasingly bigger players, with incentives and programs that larger banks often don’t offer. Don’t rule out small local banks for a mortgage source. In a recent survey by a Real Estate Association, Estate Agents were asked how their current market compared to last summer’s market. 41% said the market was better, 13% said the market was about the same, 27% said it was a little worse, and 20% said their real estate market was much worse. And yet, we’re having a mini-boom in Almeria & Murcia. Prices are starting to rise, interest rates are insane, and affordability due to the strength of the GBP is at an unexpected high. But the linchpin is demand, which is steady and healthy. So, the moral of the story is… to some extent, you have to take national news about real estate, especially in Spain with a grain of salt. Remember that all real estate is local. Find a good local Real Estate Agent and ask them about the local market trends. That’s the only way to really know. Then complete the opt-in box and you’ll be added to our mailing list.